“This Is America” (2018) is a song and music video by Childish Gambino, the nom de rap of US actor Donald Glover, he of “Atlanta” (2016- ). The video has gone viral, getting 33 million views on YouTube in the first 48 hours. It is now past 60 million. The video features a Charleston-style church massacre, schoolchildren who are up on the latest dance moves, a Ferguson-style uprising, a burning police car, even the White Horse of the Apocalypse (which is a sign of the end of the world in the Bible). It is a world where guns are valued more than people. This is America. Randomly insert a shooting or some other act of terror. The singing stops, the music changes, becomes darker, and Gambino says “This is America”. After a minute or so the shooting has been forgotten. Go back to step one and repeat. That is America! Suddenly, “out of the blue”, there is some senseless, hideous shooting and it is like everything stops – but then two weeks later the shooting is all but forgotten, only for the whole thing to repeat weeks or months later. On and on. It is strange to see it in a music video – because music in the US largely functions as a distraction. Music, dance, religion, fashion and drugs all appear in the video as an escape from a world gone mad, as a way of not going mad yourself. And yet they help keep that mad world in place. 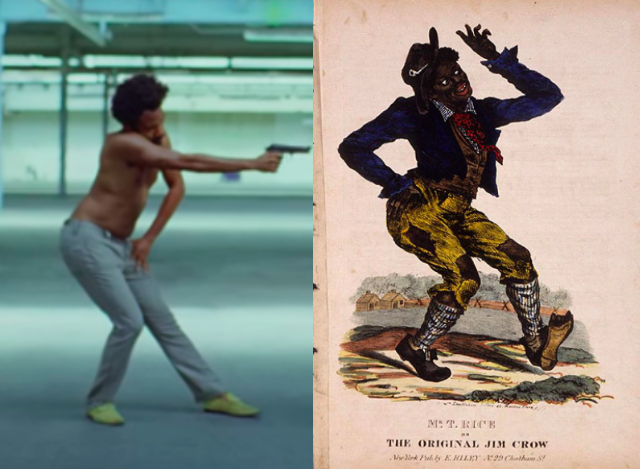 Stereotypes: The strange dance Gambino does at the beginning is taken from the minstrel show character Jim Crow. Gambino plays both Happy Darky and Black Brute, stereotypes driven by White paternalism (darkies) and White guilt (brutes). When shown together in a video, they seem strange and contradictory – because they are. But the fear of the Black Brute helps drive the need for Happy Darkies. Happy Darkies are not enough: Gambino’s singing and dancing comes to an end as he is chased through the dark by White people, all of his grinning replaced by a look of terror on his face. This is a performance piece it is quite provocative and probably triggers people who have been victims of gun violence. I do like the beats and the dancing. So many think piece about what this performance piece is about. Art is subjective there is no right or wrong, this performance piece is open to interpretation. Thanks for putting that together for us; i was seeing bits and pieces on social media. So… Let’s talk about how the racism and overall ignorance of white people made this video necessary. The Black man is innocently playing the guitar without any worries. He sat down on the chair @20 seconds into the video at first is wearing a clean set of clothing. However, when Gambino shoot him in the back of the head @52 seconds, he is now wearing tattered clothes and he appears to be disheveled. Also, his hands are now bound, symbolic of the ever present restraints intentionally placed on Black men in Amerika or in the alternative, … slavery. Gambino seems to be sending a message that whether Black people realizes this or not or even if they continue to think that we are a free people, we aren’t. @55 seconds, Gambino is seen handing over the weapon to a young Black man. To me, this symbolizes how we. As Ba stolen group of people, are sometimes complicit in our own internecine violence targeting each other, namely, Los Angeles, Oakland, Miami, Chicago and Brooklyn, amongst other cities as well. @58 seconds, suddenly, two teenager looking so-called African Americans appear. They then drag the victim off to the side. There was no mourning or showing of concern. Life goes on I guess. @2:44, Gambino appears to have symbolically shoot another person but this time, by merely extending his arms and as if his right index finger is wrapped around the trigger of a pistol. Suddenly, he appears awoken from a zombie state; light up a cigarette and walks away. The lady sitting on the hood of the car @3:21 seconds, appears to have suffered a gunshot wound or some other blunt force trauma to her left chest area resulting in her death as well. Also @3:21, the guy that was shot to death by Gambino @20 seconds, now reappears to the left rear of the screen, sitting on the same chair, with the same hood on his head, but playing the guitar again. I guess this is supposed to represent the spirit world. On one hand, @3:44, near the very end of the video, Gambino is seen running down a dark corridor with a group of white people in hot pursuit. To me, this symbolizes the Black man’s wish to escape the ubiquitous plantation and/or the white man’s oppressive system. Donald Glover has always been and still remains an enigma to me. Only Donald Glover knows what this music video and symbolism means. One thing is for certain he’s got everybody having conversations and writing think pieces. And that’s what interesting art does gets people talking and feeling and thinking. Yeah, this is America alright another school shooting in Texas today. Never heard of Santa Fe, Texas. Ten people dead by some white boy in a trench coat.